Iran’s supreme leader will deliver a sermon Friday at Tehran University, just days after a bloody crackdown at the school, according to a statement from the pro-government Basij militia. Ayatollah Ali Khamenei will give his sermon during Friday prayers. It will be closely watched for a sign of how the government plans to resolve the stalemate over the country’s recent presidential elections. 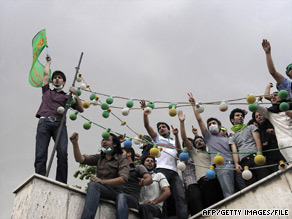 Crowds of demonstrators have been protesting in the streets of Tehran, demanding that officials throw out election results that showed hardline incumbent President Mahmoud Ahmadinejad defeated opposition leader Mir Hossein Moussavi. Khamenei has appealed to Iranians to stand behind the Islamic republic. The Basij militia — which is affiliated with the Iranian Revolutionary Guard Corps — declared Friday a day for the Iranian nation to renew its allegiance to Khamenei. Moussavi called for a day of mourning Thursday. Tehran University students told a CNN iReporter that government forces staged a massive crackdown early Monday at the university. Some students were detained in the raid. Watch students protest on another campus » Students jumped out of windows to escape the Iranian police forces who threw tear gas and beat them, according to the iReporter, a former Tehran University student who lives outside Iran. He did not want to be identified. The students said more than 100 were wounded, and there were reports of at least one death at Tehran University, but CNN could not independently verify their account because of restrictions on the international media in Tehran. Iran’s parliament speaker, Ali Larijani, has blamed the country’s Interior Ministry for the crackdown on the university, as well as other attacks on civilians, government-funded Press TV reported. However, Larijani also said “it appears that hidden hands are at work to feed foreign media outlets with propaganda,” according to Press TV. Investigating lawmakers have spoken to Tehran University students and other officials and are demanding the release of the detained students, Press TV reported. The lawmakers are also calling for the arrest and punishment of those who perpetrated the violence and for students to be compensated for their losses, according to Press TV.